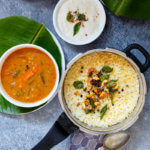 How to make Khara Pongal / Ven Pongal Recipe at home? Ven Pongal / Khara Pongal is a savory SouthIndian Breakfast recipe made with rice and lentils. Dry Roast Moong Dal in a pan until the color begins to change slightly and its fragrant.Set it aside. Once its cools down, wash it along with rice. Heat Ghee in the Pressure Cooker Pan. Add Ginger and Asafoetida and saute for one minute. Add the washed rice and moong dal to the pan along with 4 cups of water. Once the steam is released, open the lid and season with salt. For Tempering, Heat Ghee in a small pan, add Black Pepper. Once they begin to crackle, turn off the flame. Add Cumin Seeds, curry leaves followed by the addition of Cashewnuts. Fry until the Cashewnuts turn light brown. Add the tempering to the prepared Ven Pongal and give it a good mix.